I ran across a Sweet Potato and Chorizo soup in a Jamie Oliver book. I made it. It was good. But nothing to blog about. His recipe asked you to blend it up to a smooth, creamy soup, but i left it chunky. I just kept thinking, "it could be better, but with what?" Then i found this recipe from Bon Appetite and it takes the same general idea, but keeps it chunky and adds a little spinach. Now we're talking. If you're cold and want to make a hearty soup, I highly recommend this one. Heat 2 tablespoons oil in heavy large pot over medium-high heat. Add sausage; cook until brown, stirring often, about 8 minutes. Transfer sausage to paper towels to drain. Add onions and garlic to pot and cook until translucent, stirring often, about 5 minutes. Add all potatoes and cook until beginning to soften, stirring often, about 12 minutes. Add broth; bring to boil, scraping up browned bits. Reduce heat to medium-low, cover, and simmer until potatoes are soft, stirring occasionally, about 20 minutes. Using potato masher, mash some of potatoes in pot. 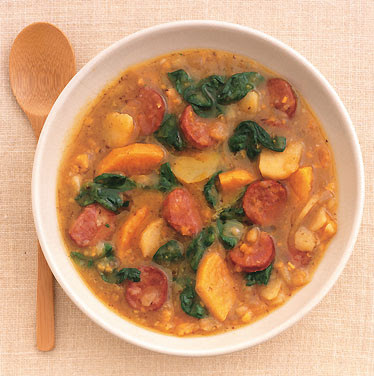 Add browned sausage to soup. Stir in spinach and simmer just until wilted, about 5 minutes. Stir in remaining 1 tablespoon oil. Season with salt and pepper. Divide among bowls and serve.